For my last session on Saturday afternoon of YALSA’s 2014 Young Adult Literature Symposium, I had the luck to attend an excellent workshop focused on utilizing young adult literature to examine and discuss effects of racism on the lives of teens of color. Sandra Hughes-Hassell and Julie Stivers, both from the University of North Carolina at Chapel Hill’s School of Information and Library Science, shared recent research, exemplary young adult literature, and several practical teaching strategies. The session began by exploring the question: “how do youth of color experience stereotypes?” Using images from recent viral social media campaigns such the #itooamberkeley campaign as well as passages from young adult novels discussing stereotypes, the presenters reminded the audience of the urgent need for these conversations. Dr. Hughes-Hassell and Ms. Stivers then began modeling best practices in having conversations about race and privilege by setting conversational norms and encouraged us to put these norms into practice during a ‘pair & share’ reflection on the images & passages. All youth are aware of race. White privilege appears in curriculum, in school structures, in libraries, and countless other aspects of teens’ everyday lives. Research has shown that positive racial identity leads to academic success. This final statement specifically refers to a 2009 report by Drs. M. Hanley and G.W. Noblit titled “Cultural responsiveness, racial identity and academic success: a review of literature,” which can be found on this page of the Heinz Endowments website. To negate the ubiquitous danger of the single story problem, we must seek out, promote, and utilize stories that break stereotypes and empower traditionally marginalized people. 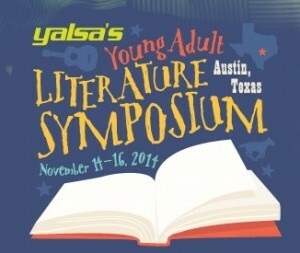 The presenters offered several examples of young adult literature that can act as such counter stories; this list includes novels such as The Absolutely True Diary of A Part-Time Indian by Sherman Alexie, Born Confused by Tanuja Desai Hidier, Open Mic: Riffs on Life Between Cultures in Ten Words edited by Mitali Perkins, If You Come Softly by Jacqueline Woodson, and many more. Librarians and educators need to talk about these books with teens. Accordingly Dr. Hassell-Hughes and Ms. Stivers briefly offered key tips to consider when planning to hold conversations about race and racism. Adults involved must do the work. We need to engage in our own courageous–and often uncomfortable–explorations about race, power, and privilege. Adults must establish trusting relationships with teens. Adults much set up an atmosphere of caring in which to have these conversations. They also recommend that librarians and educators use a critical literacy framework for these discussions and focus on action, helping youth discover their roles in creating a more just world. The remainder of the workshop time was spent learning three recommended strategies for using young adult literature to frame these critical conversations. For each strategy, the leaders guided the group through an example session and a short debrief. This method is fairly straightforward. Leaders would take two texts with certain common themes but different perspectives that shed light on some aspect of racism and systems of privilege. The example used in the workshop was a paired examination of Walter Dean Myers’ novel Monster and Jack Gantos’s memoir Hole in My Life. Using this strategy, leaders would need to generate framing questions, gather additional resources, and get teens hooked on these texts. Based on a strategy outlined by Emily Meixner in her 2006 Voices From The Middle article “Understand the questions: A community-centered approach to the teaching of multicultural literature,” this approach works best with a shared text. The leader begins with an individual character and leads participants through an analysis of that character’s identity, affiliated communities, & outsider communities before returning to the individual and examining that character again in light of their community connections. My graffiti text analysis of a passage from The True Diary of a Part-Time Indian. This final strategy comes from Teaching Tolerance and would work especially well as a way to preview a text before a group begins studying it. Participants are each given a short passage from the selected text; the selections in the workshop all came from counter stories & deal with race and racism. After reading silently, each participant must write a response within 2 or 3 minutes. Then everyone passes the text to a neighbor; now each member must read and respond to both a text and another’s first response. This process can continue as long as necessary. We then shared reflections on the process with our tables and then the larger group. The resources and the full presentation will be available on the new Equity in the Library site.